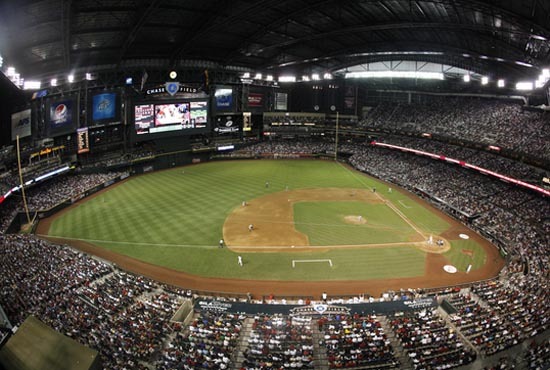 On April 10, 2007, outfielder Josh Hamilton and his former Cincinnati Reds club were taking on the D-backs at Chase Field. The now-Rangers slugger crushed his first-career home run that night. He then homered and drilled a double the very next night, as well. That was the first of many long balls hit by Hamilton in his spectacular career. It’s also been one of the many homers to sail out of Chase Field. Like many other hitters, Hamilton enjoys stepping up to the plate in Arizona, as the ballpark as long been considered a hitters’ haven. Hamilton is one of several 2011 All-Stars who have enjoyed playing inside Chase Field. The 82nd MLB All-Star Game in Phoenix received rave reviews from several members of each team – before the first pitch even sailed out of starter Roy Halladay’s hand. With a large batter’s eye in centerfield and ideal conditions inside the stadium, many believe that it strongly favors the offense. The field measures 330 and 335 feet down the left and right field lines. That doesn’t mean opposing pitchers dislike the ballpark. Atlanta right-hander and first-time All-Star Craig Kimbrel enjoys playing at Chase Field.